Longines presented today its Conquest V.H.P. 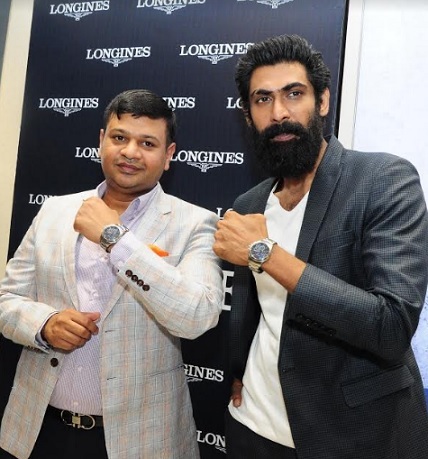 “Very High Precision” collection in India, at Longines’ Point of Sale at Racecourse Road, with actor Rana Daggubati. This line represents a new achievement in the field of quartz, combining great precision, high technicality and a sporty look, marked by the brand’s unique elegance. Longines’ history with quartz has been one full of technical innovation and feats. In 1954, the brand developed a first quartz clock, which would quickly set a precision record. It was housed in the mythical Chronocinégines, an instrument that became a pioneer in the history of timekeeping, as it provided judges with a film strip composed of a series of prints at 1/100th of a second, allowing them to follow the movement of the athletes at the moment they crossed the finish line. In 1969, technological mastery led Longines to reveal the Ultra-Quartz, the first quartz movement designed for wristwatches. A huge stride was made in 1984 with the quartz calibre fitted in the Conquest V.H.P., setting a precision record for that time. As an extension of these historic milestones, the winged hourglass brand has launched its Conquest V.H.P. model, equipped with a cutting-edge movement developed exclusively for Longines. This movement is renowned for its high degree of precision for an analog watch (± 5 seconds/year) and its ability to reset its hands after an impact or exposure to a magnetic field. These attractive features are likely responsible for its exceptional movement status, to which a very long battery life and a perpetual calendar must be added. In the true essence of Conquest, the ultimate sports line, this exceptional timepiece brings together high technicality and dynamic aesthetic. These steel or black PVD watches are available in the 3 hands/calendar (41 and 43 mm diameter cases) and chronograph (42 and 44 mm diameter cases) versions. The chronograph displays hours, minutes and seconds, a 30-minute counter at 3 o’clock, a 12-hour counter at 9 o’clock and a 60-second counter in the centre. On each model, changes are made using the intelligent crown, while the End Of Life. indicator can preventatively signal the end of battery life. The Conquest V.H.P. collection models display blue, carbon, silvered or black dials. A steel or black PVD bracelet or a blue or black rubber watch strap completes these exceptional timepieces.